The river of Amazon flows in the Northern part of the South America. It is more than 6500 km long. They thought before that the African Nile was the longest river in the world. But the satellite pictures were taken and it was determined that the Amazon was the longest river in the world. The Amazon is the most full-flowing river. The rivers and tributaries which flow into the Amazon run across Ecuador, Bolivia, Brazil, Colombia and Peru. The Amazon flows into the Atlantic ocean in the region of equator. 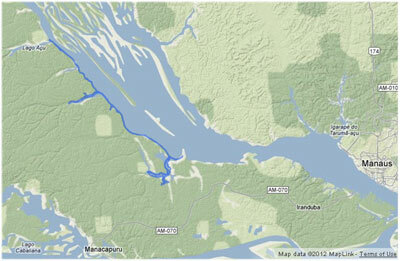 The river mouth on the satellite map. The thick tropical forest surrounds the Amazon River along all its banks. Coordinates on the Amazon with "Streets' View"
The jungle has a lot of mysteries. Lots of scientists and researchers are attracted their attention for the jungle. The big part of the Amazon's flora and fauna are not studied by the scientists yet. Hundreds of films are shot about the river. A large number of books are written about its beauty. On its way to the ocean the Amazon becomes wider than 50 kilometers in some places. We see the Amazon on the satellite map like a long winding ribbon which runs across the South American continent. To determine the river's length and the length of its tributaries and to determine the area of gigantic basic there is an online service for Google maps. One can do the necessary measurements using the satellite map. In order that the lovers of online travellings on Google maps could see three-dimensional image of the Amazon, Google had sent the expedition which made the panoramic images of the river not far from the city of Manaus. On the screen shot of the Google map you can see the expedition's route where the locality panorama was made. As a result, Google 'Street view' was supplemented with interactive images of the locality more than 40 km along the river. They made shootings both on the river and on its banks. The camera was fixed into the tripod of the trike. It made shootings from the boat side. The members of the expedition movied by trike and took photos of the jungle. The trike's construction is the Google's working out. Its small size and only three wheels give the possibility for the trike to go through the place where one cannot drive the car.